Looking for an easy science baking soda and vinegar experiment for kids? 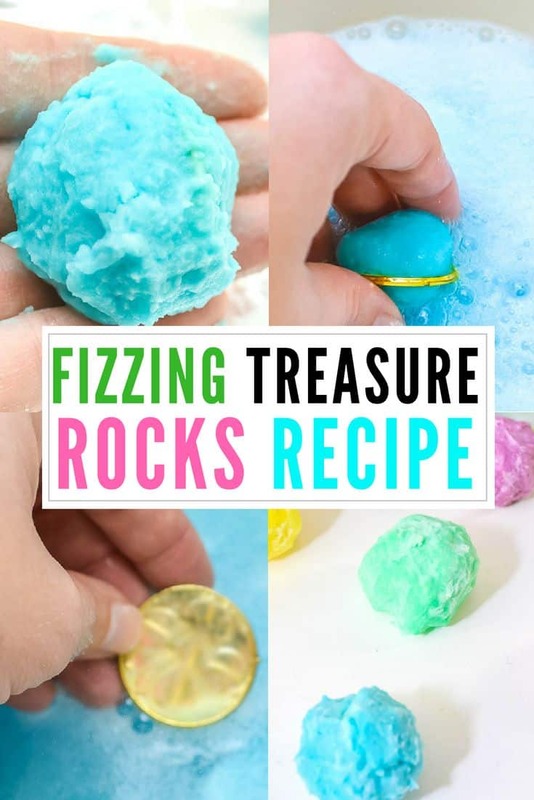 This fizzing treasure rocks experiment is simple enough that the kids can make it themselves, plus it’s a ton of fun! 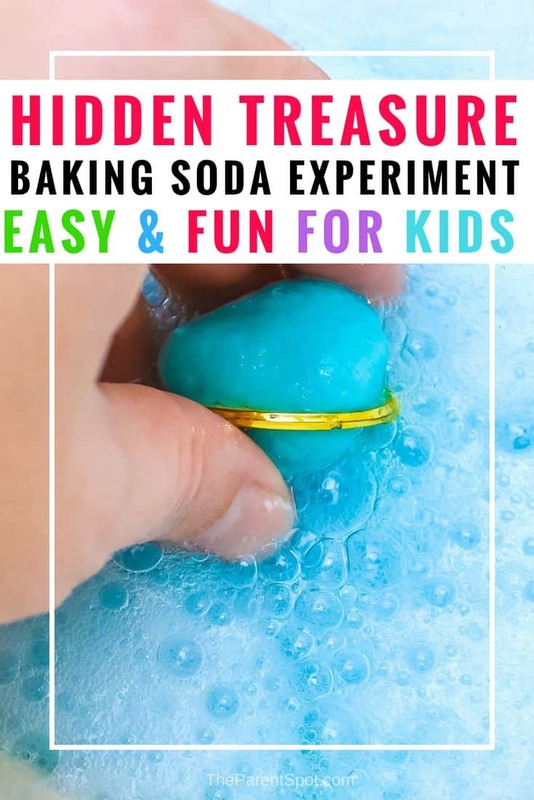 Our kiddos are huge fans of anything fizzy, and this baking soda science experiment is about as easy as it gets, plus you can make it with items that you probably have on hand already. 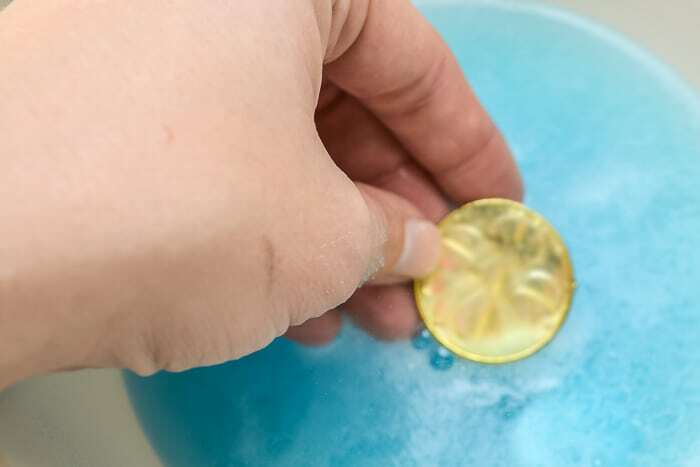 All you’ll need is baking soda, vinegar, water, mixing bowls and spoons, and a coin of some kind to put in the middle. We used cheap plastic coins, but you could even use whatever small change you have handy. 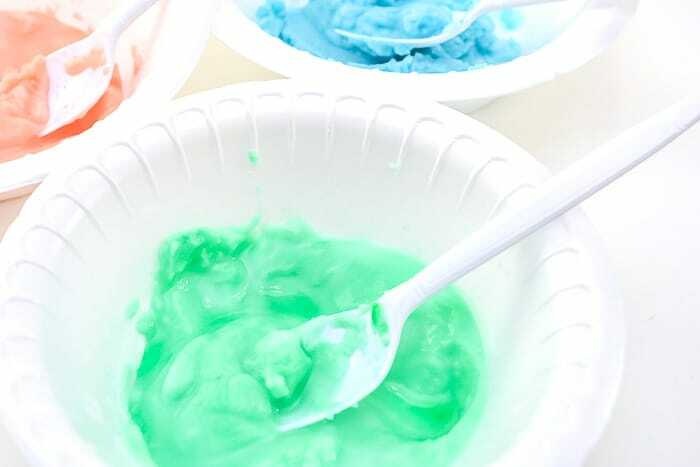 This recipe makes five colors of baking soda rocks, but you can make more or less, depending on what you’d like. Add 3 tbsp of baking soda to each of the five bowls. Add 5 drops of food color into each bowl. Add 1 tsp of water to each bowl. 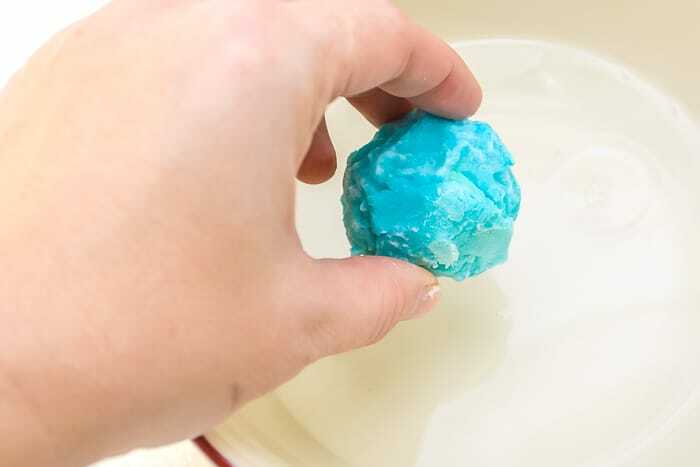 You may need to add more until the baking soda mixture is wet enough to mold into a ball. Do not make it too runny! Tip! If the baking soda mixture gets to wet, just add a little more baking soda. Now, it’s time to mold the baking soda mixture into balls. Put about a half tablespoon of the baking soda mixture in your hand. Top it will a coin, and put another half tablespoon of the the baking soda mixture on top. 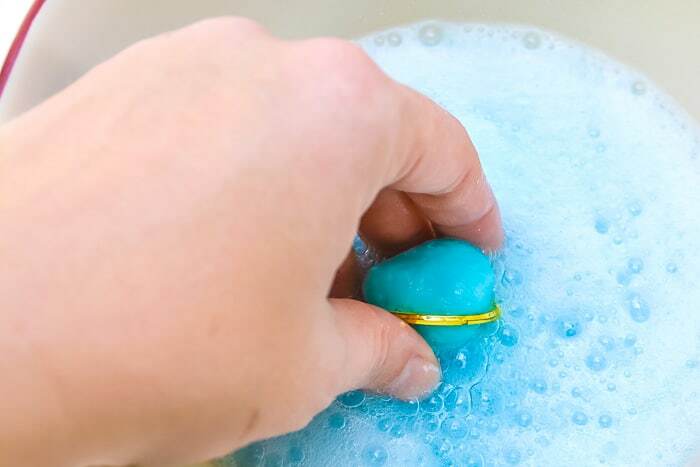 Mold the the baking soda mixture, with coin in the middle, into a ball. Repeat with and the baking soda mixture and coins for the other colors. 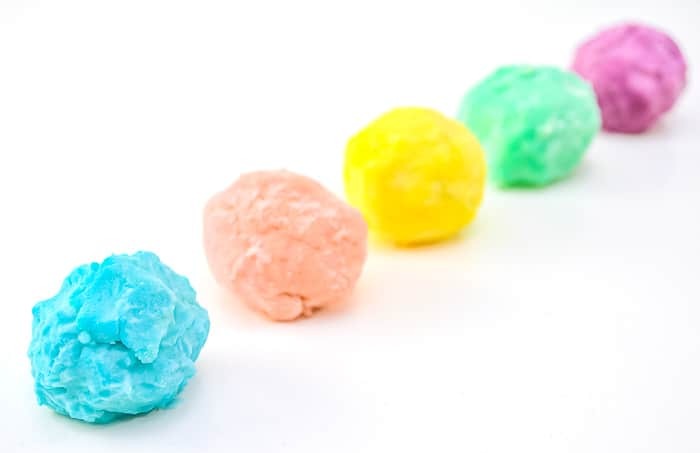 Put the treasure stones on a flat plate covered with tin foil or parchment paper, and put them in the freezer for at least 1 hour, and up to overnight. When you are ready to use them, take the fizzing baking soda rocks out of the freezer. Then, let your kiddos drop the rocks into a bowl filled with vinegar. The rocks will begin to fizz instantly. Within a few seconds, the gold coil appears! My kids and I never get tired of these baking soda experiments. They’re a ton of fun. We hid gold coins in the middle, but if you could honestly hide anything plastic and small. Tiny plastic dinosaurs hidden inside the baking soda rocks would make this into an instant dinosaur dig! Tip: when you’re done, clean your drain by pouring the fizzy mixture down the kitchen drain and leaving it to sit for half an hour. Baking soda science, or why does it fizz? In this experiment, baking soda (sodium bicarbonate) is a base. The vinegar (also called acetic acid) is an acid. When you combine baking soda and vinegar, they make carbonic acid. Since carbonic acid is incredibly unstable, it instantly breaks apart into separate carbon dioxide and water. The carbon dioxide bubbles are what you see fizzing as it comes out of the water solution!